The look of fine silverware with the convenience of disposables. Glimmerware is richly designed and mirrors the looks of premium flatware in nearly every detail. 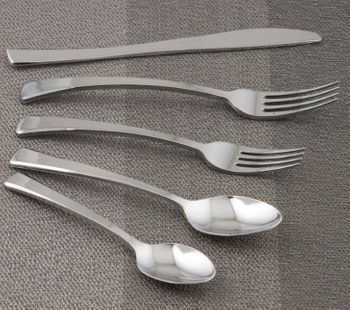 Our utensils "glimmer" like stainless steel cutlery and can give you unique and formal alternatives to real silverware. Glimmerware has a remarkable high-gloss finish combined with a sleek modern style. Silver Plastic Glimmerware Plastic Salad Forks 20ct. Silver Plastic Glimmerware Plastic Dinner Forks 20ct. Silver Plastic Glimmerware Plastic Teaspoons 20ct. Silver Plastic Glimmerware Plastic Tablespoons 20ct. Silver Plastic Glimmerware Plastic Knives 20ct.